Chuck Todd: Yeah they went to a narrative. Mike Murphy: I totally agree. regulated development within the life of the individual is observed, each of its stages has its own intrinsic value and is at the same time the basis for a higher stage. The dissonances and conflicts of life appear as the necessary growth points through which the individual must pass on his way to maturity and harmony. I won’t rehearse the narratives in question, but both Palin and Obama’s enact one of the standard lines of passage – basically the unlikely beginnings to unlikely ends sort of story. America loves a good Bildungsroman – it’s sort of the founding national mythostructure, which is no wonder given the period when the country was born. We’ve all heard his dramatic speeches before devoted followers. And there is much to like and admire about our opponent. But listening to him speak, it’s easy to forget that this is a man who has authored two memoirs but not a single major law or reform – not even in the state senate. – just after she delivered her own memoiristic self-framing as true Daughter of the Redneck Revolution. At any rate, there’s a lot to say about the political unconscious of the form, but a few things stand out. First of all, it’s always been a form invested (whether consciously or unconsciously) in class legitimation. Whether focused on the emergence of a newly literate bourgeoisie out of the hovels of the artisans (think Great Expecations, Mr Pip learning his letters and the like) or informational workers from the ranks of the selfsame bourgeoisie or petty bourgies (oh, just about all of them – Portrait is a good example), it does the work of showing the work – the work of self-elevation, the rise from meagre roots whether financial or educational or what have you. And while it’s easy to say that every American election has been about class legitimation – or even that the American democratic political form is a form based on annual selling the populace on the virtues of being led by this particular set of betters – it’s clear that the current crisis in capitalism has forced the narrative of meritocratic legitimacy to the absolute foreground of the electoral stage. Noonan is of course right about Republicans traditionally having a hard time with “narrative.” It’s easy to see why: the stories are generally fucked-up arcless little numbers, or if they have arc, it comes in spots and is hard to synthesize the “dissonances and conflicts” of these priviledged lives into a coherent story. (Once the Democrats realize that they are most certainly going to lose this election, they’ll hopefully go to work, Rove-style a la 2000, on the semi-narrative of McCain’s Vietnam capitivity, begging the question of what sort of longterm psychological effects trauma like this has on an individual, an individual with his finger on the red button and the like). But she’s undoubtedly wrong about Palin herself (who has been drawn from outside the usual lineup of Yale aristrocrats and Haliburton fixers) who will likely win the election for McCain, so long as they negotiate the tricky issue of fronting the VP candidate because the P candidate is so goddamned awful on stage. At any rate, all of this is basically the superstructual echo of the basic point of this piece by Aziz Rana on n+1’s site about Obama, the election, and meritocracy. Throughout our history there have always been multiple versions of the American dream. These accounts held in common the hope that hard work, discipline, and self-reliance would allow those recognized as citizens not only to improve their economic lot and achieve personal happiness, but to participate fully in political life. Today, however, only one version of the dream continues to make sense as a sustainable personal project. This is the dream exemplified by Barack and Michelle Obama—as well as by their former rivals Hillary and Bill Clinton—a dream of success through higher education and a life in professional work. It is a vision of social advancement that leaves little room for historically important narratives of blue-collar respectability. Rana’s piece, when seen in the light of the “narratives” I’ve been discussing here, exposes a foundational contradiction in the American political system. Or, if not a contradiction, at least a fatal blindspot, an entrenched impossibility. 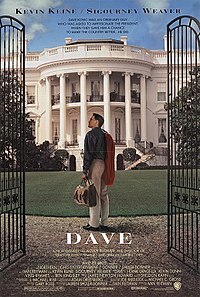 In a system that’s weighted (perceptually if not practically, and perception leads the praxis here) toward the president as the embodiment of popular will, it’s very very difficult to imagine how a “narrative of blue-collar respectability” could ever make its way to the definitive foreground of American politics. Obama may be as close as we could ever get, what with the community organizing and the like. The system is attuned to, and has always predicted, rule by meritocracy, which we all know has never been and will never be based on equal-start merit. And even if it were, would it change matters all that much? Think of all of those countless numbnuts Hollywood films about unlikely characters bumbling their way into Washington power – the donut eating prole, the dumb blonde, the black dude who didn’t go to Columbia… The tagline of the one pictured above: “In a country in which anybody can become president, anybody just did…” Their disneyfied absurdity, their thumb-sucking popcorn munch, is a register of the fact that none of us, down deep, believes that another narrative is possible here, not at least given the system that we have.